I had a six friends and their kids over for dinner this past Sunday. We had quite a good time. It was a beautiful hot day and we ate outside. I live in a newly built house and our backyard is big, but we haven't had a chance to do much with it yet. So... no fence, no deck, no patio, no patio furniture. No problem, I just moved my dining room table out to the backyard! It worked out fine. And because there was NO shade, Mario put up a big blue tarp over the "picnic" table. And THAT is why there is a slightly blue tinge to my pictures. If you make these at home, and they turn out blue... you did something wrong!! 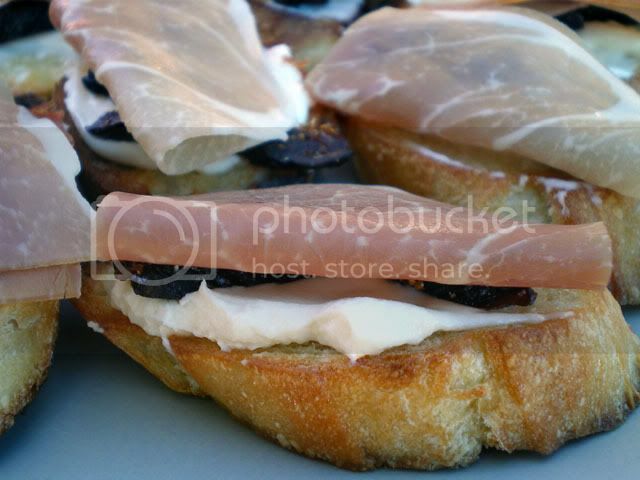 These mascarpone, fig and proscuitto bruschetta's were inspired by a recipe that I saw over on Kirsten's Home Cooking.... I tend to make a lot of her recipes....to the point where I wonder if I should just stop writing a blog, and just post a link to Kirsten's site everyday. I can't say I followed her recipe exactly because true to form, I took one look at her pictures and assumed I knew how to make it (my relationship with recipes could be equated to a man's relationship instruction manuals.... to be referred to only in dire circumstances). So it wasn't until after I made this recipe that I realized I was supposed to put garlic somewhere. At any rate, I thought these were fabulous, and I got many compliments on the recipe from my guests. 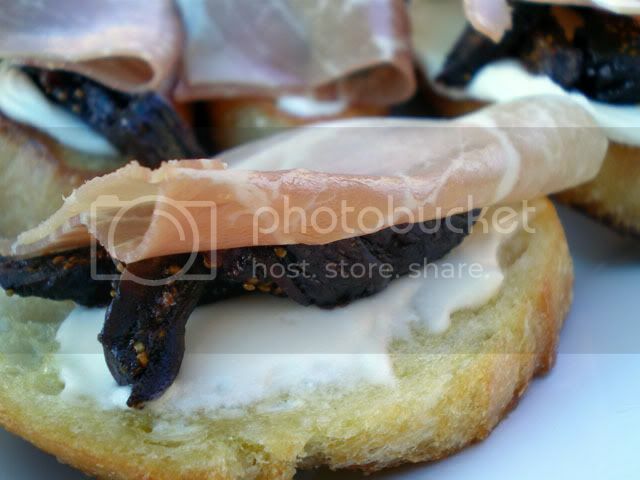 Mascarpone, Fig and Proscuitto Bruschetta. 1. Rub bread with garlic (I missed this step, but they were still really good). Brush with olive oil, and toast in the oven until slightly browned. 2. Spread toasts with Mascarpone cheese and top with some sliced figs. 3. Slide the toasts down the counter to your helper (I commandeered a dinner guest, thanks Bill!) who will place a third of a slice of proscuitto on each toast.